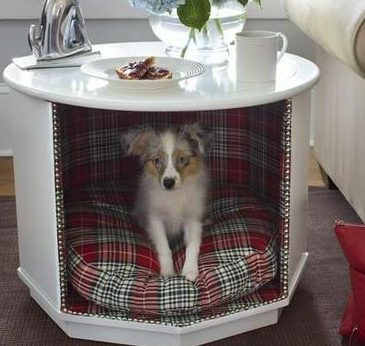 DIY Dog Bed End Table | Ramblings…. 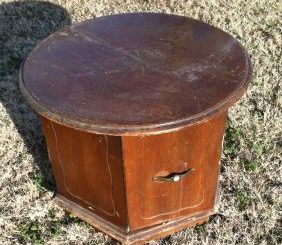 So anyway, with help from my son who loves poking around in antique stores I finally found this ratty old table – and it was ratty. Took the doors off and sanded… and sanded and sanded and… well, you get the idea. 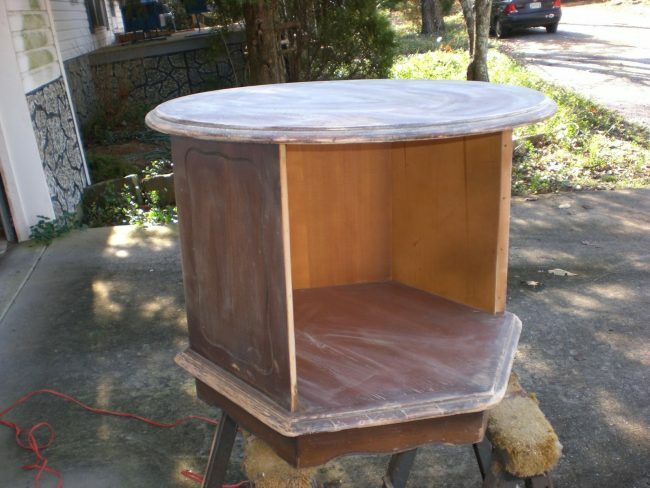 And while I sometimes enjoy refinishing furniture – sanding is not a fun part. Primed with two coats of primer – let cure for 7 days, then 3 coats of yellow and then 3 coats of Minwax polycrylic on the top – which took more time and had to cure 24 hours. Interior has upholstery fabric glued with spray adhesive, and stapled inside with the nail trim finish. The interior required a lot of ‘crawling around on the floor. Waaay too much fun! And, too much waiting – I am not a patient person!!! Emma Grace wasn’t shy about trying it out. She had to ‘break it in’ before it was moved to its permanent location. 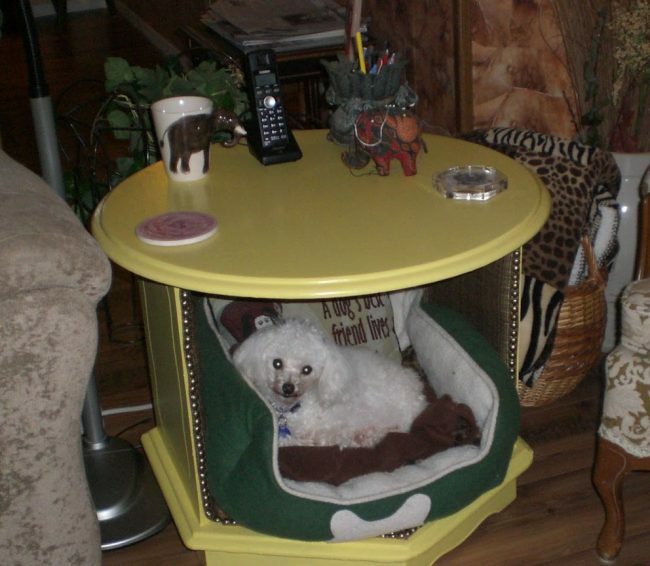 So a little while after putting it all together went back in the living room and there’s Frosty – he loved it and used it often. Now there’s Koda – AND, he likes it too! As I said, I did this project a number of years ago – not sure I have that much energy now, but I’m glad I took pictures and wrote notes. 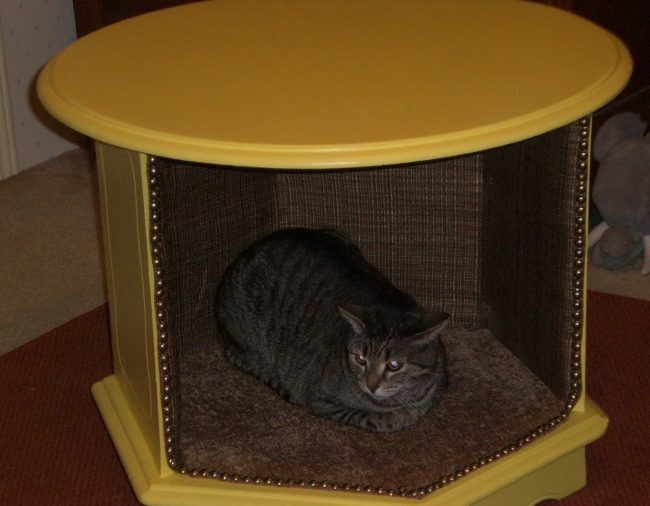 This entry was posted in At Home, DIY and tagged antiques, Asher, cat, DIY, dog, dog bed, Frosty, Koda, son, table, yellow. Bookmark the permalink. It’s beautiful. I remember when you first made it, and I’m happy to see it’s still getting good use. I knew a few of my “old friends” might remember, but the new friends didn’t know about the bed. I’m so pleased that Koda is using it – took him awhile, but he’s there frequently now. I remember that sweet bed when it was Frosty’s. Glad too see it’s still being well-used by Koda. Caleb always liked to be under the little kitchen table so when I saw sofas put out at the curb for trash I would take one of the seat cushions and they fit perfectly nestled into the four legs of the table, and that way when it got dirty or dog stinky I could just throw it out and take another one off another sofa! I usually had one or two in reserve. Ahhh, that’s a great use for old sofa cushions. 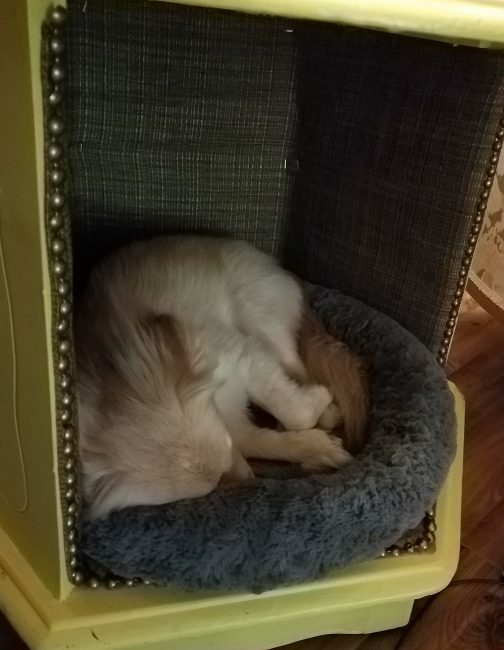 It took Koda a while to start using the bed on his own, but he does use it pretty frequently now. He is enough bigger than Frosty that he has to curl up in it, but he doesn’t seem to mind.